About half of American adults do not get enough vitamin A, a nutrient needed for healthy skin - it helps maintain the epithelial tissues that make up the skin’s surface, eyesight - inadequate intake can lead to poor vision in dim light and possibly age-related macular degeneration, and immune function - vital for development of immune cells. Top sources include sweet potatoes, butternut squash, carrots, pumpkin, cantaloupe, pink and red grapefruit, spinach and kale. I found several sources stating the same. I suppose those little rabbits already knew all that before we did; I have never seen one wearing glasses. Grin. One medium carrot (78g) has 35 calories and provides both a good source of vitamin K and more than twice the Daily Value of vitamin A, which studies show helps the eye to adapt from bright light to darkness. Carotenoids found in carrots seem to lower the risk of age-related macular degeneration (AMD), making carrots a Super food for your Eyes. Another carrot compound, falcarinol, reduced the risk of developing cancerous tumors in rats by 33%, according to British and Danish researchers. While raw carrots make a healthy and tasty snack, cooking carrots brings out their sweetness and helps enhance carotenoid absorption and also brings out their sweetness. I discovered that there are a lot more healthy benefits to carrots. Not only can they improve the appearance of the skin, hair and nails, when taken daily it can lower cholesterol and blood pressure as well. Carrots are rich in fiber and therefore helpful and healthy for the colon. They can regulate blood sugar, increase menstrual flow and can enhance the quality of breast milk. When eaten raw, the beta-carotene, which is a strong antioxidant, can prevent cancer and carrot juice prevents bodily infections and is claimed to be valuable for the adrenal glands, but only when taken on a daily basis. 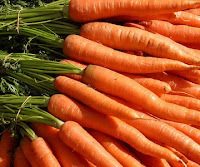 Carrot is also helpful in the following cases : Obesity, Poisoning of the blood, Gum disease, Insomnia, Inflamed Kidneys, Liver, Gallbladder, Alzheimer's disease, Colitis, Ulcer Painful urination. I will abstain from giving recipes. I think we all know how to cook carrots and you don't even have to. They are just as delicious raw, as well as cooked.